Web hosting and web services provider GoDaddy is continuing to expand its resources for small business owners, following its recent IPO. The company has now closed on the acquisition Elto, a San Francisco-based startup which had been offering a marketplace that helped connect business owners and other non-technical people to web developers who could help them establish and improve their web presence. Terms of the deal were not disclosed, but Elto had previously raised under a million in angel and seed funding, the former from the founders of 99Designs, and the latter from Australian fund Blackbird Ventures. Elto, originally known as Tweaky, was founded in 2012 by P.J. Murray and Ned Dwyer, who realized that small business owners were often struggling to find qualified and verified web developers who could create their websites, update them with new functionality, or otherwise generally make improvements and changes on their behalf. On Elto’s marketplace, the company would carefully vet developers who applied, and then help them get connected to small business clients. As of the time of the acquisition, the company had grown to 25,000 customers, who paid for Elto’s services in one of two ways. They could submit a brief and a project manager would define the scope and give a ballpark price, or they could choose one of a couple of hundred “fixed price” services for things which had more established price points. According to Dwyer, the projects could range anywhere from $99 up to over $5,000 but the average project size was around $300. He also says the deal makes sense for the startup because many of his customers were already also GoDaddy customers. “For us, this is an opportunity to reach a bigger scale – 12 million customers versus 25,000 – it’s a completely different beast,” he adds. The 12 million figure he’s referring to are the 12 million small business customers GoDaddy has today, out of a total customer base of 13 million. Over the past year, GoDaddy has been working to better understand that customer base and identify their needs in order to help them grow their businesses online and offline. Now the company is working to expand its offerings and tools for the web professional audience, too. Today, many small business owners may own the actual GoDaddy account, but they want a web pro to handle all the work involved with their website creation and maintenance. 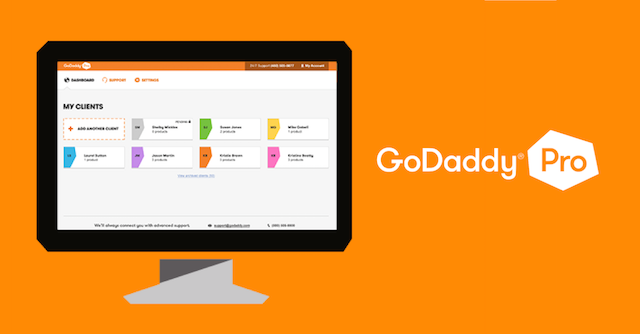 To that end, GoDaddy has recently launched a number of tools to help this web pro audience, including finance management tools, the ability to monitor customers’ sites, delegation tools that let pros log in and act on a customer’s behalf, and more. Many of these tools are now being bundled together in GoDaddy Pro, a brand-new program currently in beta, that’s designed specifically to serve web professionals. The idea with the program is to help web pros make more money and save time, while serving their GoDaddy clients. This is where the new acquisition Elto will now fit in – the marketplace will be transitioned over to become a key piece to GoDaddy Pro in the weeks ahead. For now, Elto’s current customer base will be handled separately, but the plan is to transition them to GoDaddy over time. As a part of GoDaddy, Elto’s pricing may change. Before, notes Dwyer, Elto was seeing 40%-50% margins, but at GoDaddy’s scale they can reduce that down, he says. Elto was previously a team of ten, but only the two co-founders are joining GoDaddy following the acquisition. Meanwhile, web pros are now being invited to sign up for GoDaddy Pro, ahead of its public debut.